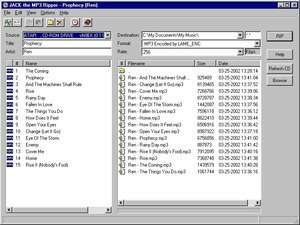 Jack the CD Ripper is an extremely efficient freeware ripping tool that enables the user to extract audio from a CD and export the music into either wav, Windows Media Audio (*.WMA), ogg or mp3 format. No need to rename every track that you rip, with Jack once the CD is inserted it will download the CD information from an online database, this currently includes the title of the CD, Artist and track names. Version 2.01.001 is a freeware program which does not have restrictions and it's free so it doesn't cost anything. For security reasons, you should also check out the Jack the CD Ripper download at LO4D.com which includes virus and malware tests. Additional screenshots of this application download may be available, too. 2.41 out of 5 based on 25 ratings.